Don't worry the European challenge will hopefully continue later this evening. 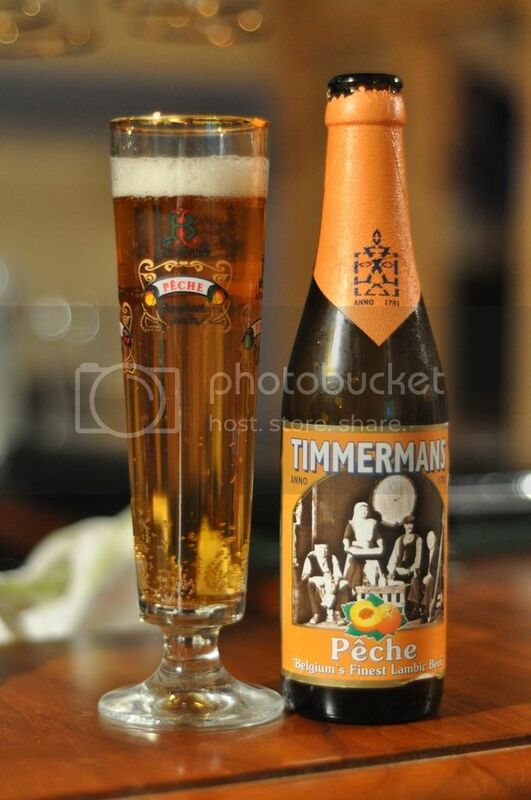 Another beer from the Timmermans arsenal, and this one apparently is the highest selling fruit beer in Belgium. This is also the cheapest fruit beer I've ever seen, so hopefully it's not too bad. From what I've heard about this beer, it is quite unusual to find it in a bottle. Apparently in Belgium it's served almost exclusively in cans, mostly at food kiosks... figure that out. Anyway hopefully this bottle form has survived the boat trip, because I'm really looking forward to this one. The pour is at least encouraging, this is the first of my fruit beers in this challenge that actually pours like a beer. The colour is a dark golden colour, with a thick looking white head but it does have a number of bubbles in it. The beer seems rather thick as the bubbles rise quite slowly through the beer. The head is magnificent, a good sized ammount remains for most of drinking and laces the glass brilliantly. I'm not sure whether I can honestly call this a beer, the beer is very sweet and thick it's more like a jam than a beer. The flavour that is there is very pleasant but not complex. Basically all you get in this beer is a peachy/apricotty flavour with maybe a tiny hint of peppery hops. The thickness of this beer would make it really hard to drink lots of, however it's actually quite good in it's own rights. As fruit beers go this one is on the sweeter side. This isn't everyone's cup of tea I know but I am still going to recommend it anyway. This is a good fruit beer, albeit on the slightly thick side. It showcases all the positive elements of the peach without being disgustingly sweet. I would suggest this beer as an after dinner beer as it is probably the last beer you are going to be able to drink for the night. I know this review has rambled on a bit so hopefully it makes some sense.